Is it possible that there is a purpose behind the universe? One that is consistent with modern science and especially the Big Bang and evolution? I propose that there is such a grand purpose and that this has profound implications for the meaning of our lives. More than 30 years ago, Nobel Laureate Steven Weinberg famously (some would say infamously) wrote in his book, The First Three Minutes: “The more the universe seems comprehensible, the more it also seems pointless.” This is a pretty bleak view of things. If the universe is pointless, then probably so are we. Things have changed dramatically since then. The evidence today is quite the opposite. It has come to light in the fields of physics and astrophysics over the past two decades that there are numerous coincidences and fine-tunings of the laws of nature that altogether seem extraordinarily unlikely and need to be explained. These key properties of the Universe have just the right values to make life possible. It is possible to explain these coincidences and fine-tunings as just a matter of statistics. This involves a concept called the multiverse, which means that our apparently special universe is just one of a vast number of universes all of which may be different from each other in unimaginable ways. There is no evidence whatsoever for this, but it makes for an interesting theory. 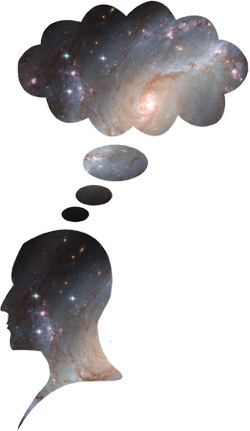 I am proposing that an equally likely – and perhaps even slightly more likely – explanation is that there is a conscious intelligence behind the universe and that the purpose of the universe and of our human lives is very intimately involved with that intelligence. This intelligence – and we might as well call it God – has nothing to do with the antievolutionary view called “intelligent design.” On the contrary, a Big Bang 13.7 billion years ago, a 4.6 billion year old Earth, and Darwinian evolution are essential ingredients of a purposeful universe. This God needs Darwin to carry out his plan. Two of the most prominent and accomplished astrophysicists of the last century were Sir James Jeans and Sir Arthur Eddington. Both espoused the view that consciousness was likely the foundation of the universe itself. Jeans wrote in his The Mysterious Universe: “The universe begins to look more like a great thought than like a great machine.” Even Max Planck, the discoverer of the quantum, wrote in The Universe in Light of Modern Physics that “there are realities existing apart from our sense perceptions.” And exceptional human experiences and accounts of mystics throughout the ages point in the same direction of a fundamental underlying consciousness. There is indeed mounting evidence from the opposite side of physics – the microscopic realm of quantum mechanics –that this view of consciousness as the basis of reality, is correct. As long ago as 1932, mathematician John von Neumann showed that quantum mechanics requires consciousness to produce any kind of measurement result. The connection between quantum mechanics and consciousness has ever since been a nagging, unwelcome, best to pretend it doesn’t matter sort of skeleton in the physics closet. But new experiments have pried open the closet door. Quantum theory states that it is the act of observing an object to be at a certain place that actually causes it to be there. This is verified in the laboratory. But we ourselves and the world around us are comprised of atoms which are governed by quantum laws. If consciousness is at the heart of quantum physics (and it is), that puts it at the basis of everything. Recent bestsellers have denounced the evils of religion and proclaimed that science has shown that there is no God. But the human misuse of religions and the existence of God are very different matters. The problem is: what kind of God are we talking about? “Destroy it utterly!” says the God of Deuteronomy. Nowadays he would probably issue the command to nuke the enemy city. If that nut case is God, add me to the ranks of the atheists. But I say with confidence that there will be no retribution coming my way because that God does not exist. He is merely the product of the dark side of the human imagination. I am proposing a new concept of God, which is actually very old. It is part of the Perennial Philosophy, which is basically a distillation of core religious beliefs throughout the ages. My contribution is to bring this to the attention of a world sorely in need of an uplifting sense of purpose, and to put it in the context of recent scientific discoveries about the exceptional properties of the universe and the actual scientific evidence for consciousness creating reality at the quantum level. Aldous Huxley made the heroic effort of collecting and comparing this mystical stream of fundamental metaphysical truths from many cultures and eras in his book The Perennial Philosophy. The physical universe of matter is not the sole realty. Other non-physical realities exist which may contain other life-forms. Interestingly this is consistent with string theory and M-theory at the forefront of modern physics. Our human nature has both a material side subject to physical laws, birth, and death, as well as a non-material immortal spirit or soul. All humans possess a capacity to intuitively perceive the true multifaceted nature of ourselves and the greater reality. But the greatest truth of all is the saying: Thou art that! Here “thou” refers to our own spiritual nature and “that” is God. And therein lies the answer to the great riddle: If God is responsible for creating the universe (in the Big Bang), why in heaven’s name did he do this? The answer, I believe, is to experience physical reality in all the diverse ways possible in such a universe. That is why I think that the just right laws of physics are really the just right ideas of God made manifest, the “great thought” that Jeans proposed. An infinite intelligence selects an ensemble of compatible ideas that then become the laws of nature of a given universe. The proper combination results in a universe where life can originate and evolve and the consciousness of God can then experience its potential. This does indeed give us each a great life’s purpose: to create God’s experience as the incarnations of him in physical form. The Jesuit paleontologist Teilhard de Chardin wrote: “Surely we are not human beings having a spiritual experience, but spiritual beings having a human experience.” I would modify this to say: We are God having a human experience. This is in no way in conflict with science, and has the potential to transform human consciousness. Reprinted, with permission of the publisher, from The Purpose-Guided Universe © 2010 Bernard Haisch, Ph.D. Published by New Page Books a division of Career Press, Franklin Lakes, NJ. 800-227-3371. All rights reserved. Bernard Haisch, Ph.D. is an astrophysicist and author of over 130 scientific publications. Haisch did postdoctoral research at the Joint Institute for Laboratory Astrophysics, University of Colorado at Boulder and the University of Utrecht, the Netherlands. Prior to his career in astrophysics, Haisch attended the St. Meinrad Seminary as a student for the Catholic priesthood. He lives with his wife, Marsha Sims and their three children.